It's not a secret that Nate Berkus for Target collection came out on October 21, 2012. There are some stuff I liked and there's also some stuff I was rather disappointed with. For example, the gold colored metal bowl, I thought it would have a nice weight. It was so thin and light that it felt more like paper than metal. The odd decorative lacquered chains just don't work. I predict they will be in the sale bin sooner than later. The more successful designs includes the lamp collection. I thought the bold graphic lamp is very interesting; works well with modern contemporary homes. The knit dark gray pillow with silver colored thread is also very nice and soft. 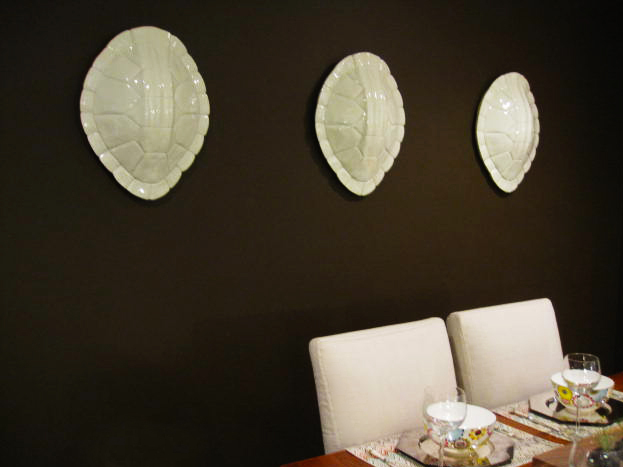 However, my favorite item from the collection is the white lacquered tortoise wall sculpture. When you line them up on a dark colored wall, they make a great impact. Top designers such as Mary McDonald, Kelly Wearstler, and Jonathan Adler have been using these kinds of things for awhile now. In fact, Jonathan Adler sells a Tortoise lamp on his website.... better made for sure and the price reflects that. Interestingly Nate Berkus also has a line for HSN. They are definitely pricier than his Target collection. However, Nate's collection at HSN is mostly furniture focused (hence more expensive). Some of the headboards at HSN compliments his bed sheets at Target quite nicely.